Shirley is survived by son Bob (Beth) Moeller, De Pere; three grandchildren, Jeremy (Ann) Moeller, Green Bay, Angie Moeller, De Pere and Chad (Vanessa) Moeller, Peoria, AZ; two great-grandchildren, Nathaniel and Lillian; nieces-in-law, Sandy Lawrie and Barbara Ann Lawrie; and great-nieces and nephews: Chuck Johnson, Andy Johnson, Dave Tollefson, Debbie Burk, Bill Lawrie, Randy Lawrie, Heather Lawrie-Smith, Meredyth Nelson plus many other cousins. She was preceded in death by her husband Bill in 2003, her parents and numerous brothers and sisters-in-law. A Mass of Christian Burial will be held at 11:00 a.m. Tuesday, April 23, 2019 at St. Joseph’s Catholic Church in Sturgeon Bay. Entombment will follow at the Shrine of the Good Shepherd Mausoleum in Green Bay. 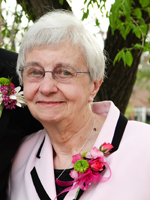 Visitation will be 4-7 p.m. Monday, April 22 at Forbes Funeral Home in Sturgeon Bay and again at 10 a.m. Tuesday at church until time of mass. A prayer service is scheduled for 7:00 p.m. Monday at the funeral home.